1792 Washington President Pattern silver half dollar, graded EF Details. Hover to zoom. Two 1792 silver patterns were among the highlights of the Newman XI sale. The Numismatic Guaranty Corporation (NGC), the third-party grading service that has certified all of Eric P. Newman’s coins, has announced that the total prices realized for NGC-certified Newman coins has topped $60 million. The milestone comes after the Newman Part XI sale by Heritage Auctions, November 7-10, 2018. The top coin in the sale was a 1792 Washington President Pattern silver half dollar, graded EF Details. One of only five examples known, it realized $204,000. Another 1792 pattern half dollar, a rare plain edge silver variety by Peter Getz, realized $144,000. Also noteworthy was the rare pewter Newman 1-B 1776 Continental dollar, graded AU-55, that realized $57,600. Newman, a gifted scholar, was particularly well known for his groundbreaking research on Continental dollars. He owned many examples, including an extremely rare silver “EG FECIT” variety. 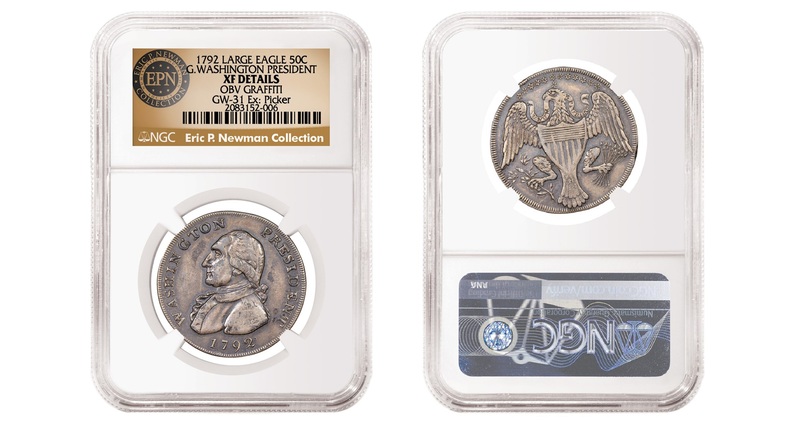 That coin sold in Newman Part IV for $1,410,000 after being graded MS-63. NGC was chosen to certify more than 7,700 coins, tokens, and medals from Newman’s collection. The selections included coins from dozens of nations and spanned more than 1,000 years of history. A gallery of the vast collection can be viewed on NGC’s website. Newman’s collection was built over more than 90 years by a man whom many consider to be the greatest numismatic researcher and writer of all time. Sadly, Newman passed away in 2017 at the age of 106. In 2013, the first selections from the nonprofit Eric P. Newman Numismatic Education Society (EPNNES) were sold at auction. There have been a total of 11 auctions (seven coins and four paper money) along with a standalone sale of a unique 1792 Washington President Pattern gold eagle, graded EF-45★, that realized $1.74 million in August 2018. 1792 Eagle & Stars gold Washington President $10, graded EF-45★. 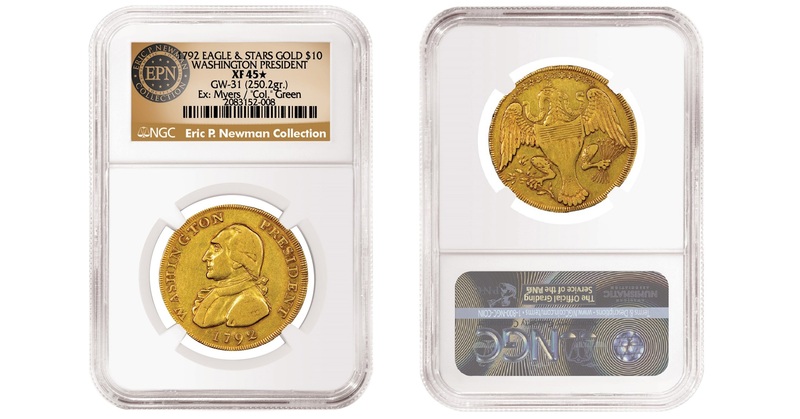 NGC certification was essential in bringing the renowned and sophisticated Newman Collection to market. NGC’s attributions and grades gave bidders greater comfort, which helped the coins realize their maximum potential. Eric P. Newman assembled one of the most impressive coin collections over the course of his extraordinary life. NGC is extremely honored to have been selected to certify it prior to sale. (1) The 1792 Washington President Pattern gold eagle, graded EF-45★, that realized $1.74 million in August 2018. This was the coin most cherished by Newman, who believed that this coin was expressly struck for, presented to, and carried by George Washington. (2) A 1796 quarter, graded MS-67+★, that realized $1,527,500 at the Newman II sale in November 2013. (3-tie) A silver 1776 Continental dollar (EG FECIT), graded MS-63, that realized $1,410,000 in the Newman IV sale in May 2014. (3-tie) A 1792 one-cent (Judd-1), graded MS-63+ Brown, that realized $1,410,000 in the Newman IV sale in May 2014. (5) An 1852 Humbert 10-dollar, graded MS-68, that realized $1,057,500 in the first Newman sale in April 2013. (6) An 1861 Confederate States of America half dollar, graded PF-40, that realized $960,000 at the Newman IX sale in November 2017. (7) A 1795 Draped Bust, Off Center Bust dollar, graded MS-66+★, that realized $910,625 in the Newman II sale in November 2013. (8) A 1799 7×6 Stars dollar, graded MS-67, that realized $822,500 in the Newman II sale in November 2013. (9) An 1803 Large three-dollar, graded MS-65+, that realized $705,000 in the Newman II sale in November 2013. (10) A 1783 ‘100’ Plain Edge Nova Constellatio silver 100 units, graded AU-55, that realized $705,000 in the Newman IV sale in May 2014. EPNNES Foundation Statement Items being sold are from the extensive collection of Eric P. Newman Numismatic Education Society (a Missouri not-for-profit corporation) and have been assembled over a period of 90 years. Proceeds of the sale of all items will be used exclusively for supplementing the Society’s scholarly numismatic research efforts and for the benefit of other not-for-profit institutions selected by Eric P. Newman Numismatic Education Society for public purposes.